Based on the valence model of expectancy theory and the Cornell model of job satisfaction, this field study investigated the relationship between reward contingency, unemployment, pay satisfaction, job satisfaction, and functional turnover. The latter of which separates turnover into four categories: poor performing leavers, good performing leavers, poor performing stayers, and good performing stayers. It was conducted with a geographically dispersed sample of sales representatives (i.e., from 25 states and 66 cities), resulting in unemployment rates that ranged from 2 percent to 12 percent. The sales representatives were employed by four companies that paid different combinations of salary and commissions, ranging from mostly salary and little commission to 100 percent commission. 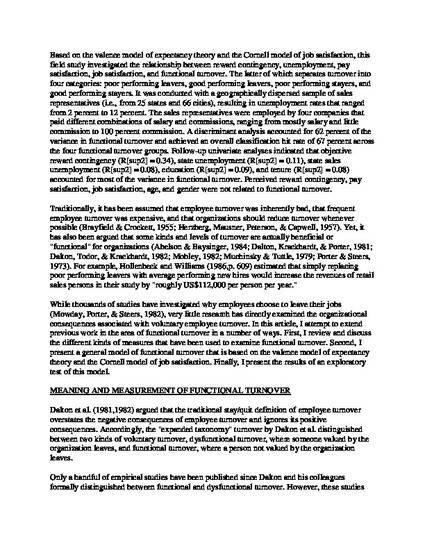 A discriminant analysis accounted for 62 percent of the variance in functional turnover and achieved an overall classification hit rate of 67 percent across the four functional turnover groups. Follow-up univariate analyses indicated that objective reward contingency (R[sup2] = 0.34), state unemployment (R[sup2] = 0.11), state sales unemployment (R[sup2] = 0.08), education (R[sup2] = 0.09), and tenure (R[sup2] = 0.08) accounted for most of the variance in functional turnover. Perceived reward contingency, pay satisfaction, job satisfaction, age, and gender were not related to functional turnover. NOTICE: this is the author’s version of a work that was accepted for publication in Human Resources Management Review. Changes resulting from the publishing process, such as peer review, editing, corrections, structural formatting, and other quality control mechanisms may not be reflected in this document. Changes may have been made to this work since it was submitted for publication. A definitive version was subsequently published in Human Resources Management Review, VOL 9, ISSUE 4, 1999 http://dx.doi.org/10.1016/S1053-4822(99)00033-9.